– [from the Orwell Prize website]. – George Orwell, May 1945. 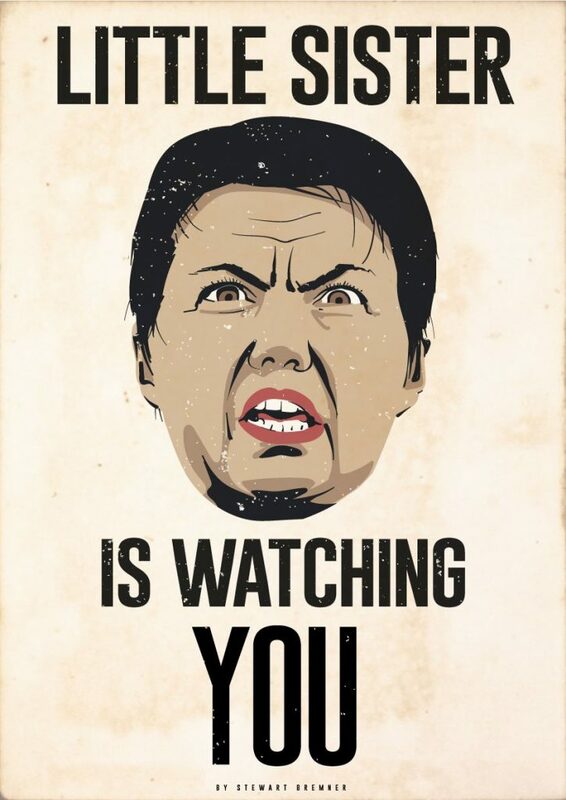 Ruth Davidson used the wrong Orwell text in her extraordinary speech to the Orwell Prize (read the full text here). Instead of Notes on Nationalism she should have used 1984, as her party has done more than any over time in Britain to render Orwell’s fictional dystopia into fact. Quite what the Orwell Foundation, who issued the invitation, thought they were doing inviting a politician who has created their own image through nationalism and who’s own government has taken surveillance measures to unprecedented heights, to talk on liberty and anti-nationalism is not entirely clear. The party that brought you the Investigatory Powers Bill lecturing you on Orwell. The British politician possibly more than any other who has defined themselves by their Britishness, and regularly issues photographs on top of a tank, draped in a Union Jack, lecturing you on anti-militarist and anti-nationalist Orwell. Before we go on to look at what she actually said, it’s worth remembering the IPB and what it means, as it has quickly disappeared down the Memory Hole. Forces your Internet Service Provider to keep your Internet Connection Record (ICR) – a list of services and websites you use and when – for 12 months. Obliges communications companies to retain your communications, hand them over when served with a notice, and remove encryption when requested. Creates new rules about who can intercept your communications, ie. who can read your messages. Explicitly legalises intelligence agencies, law enforcement and the armed forces interfering with (ie. hacking) electronic equipment – for example, by covertly downloading the contents of your phone or remotely accessing your computer. Allows security and intelligence agencies to use these powers in bulk to obtain large numbers of data about a large number of people. Create warrants for authorities to examine “Bulk Data Sets” – basically, a lot of people’s personal information – such as medical records and tax histories. It’s just worth remembering that context before we go on to enjoy Ruth’s talk about “Orwellian-nationalism”. 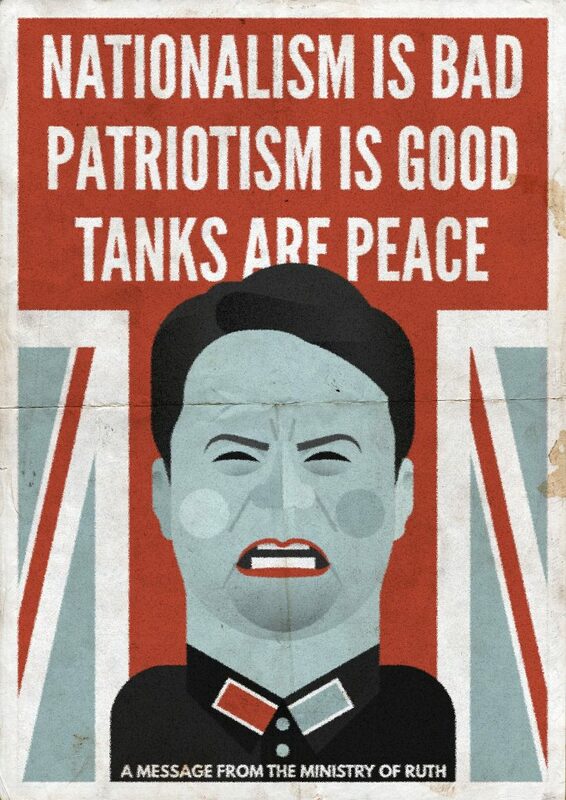 As David Dunn has commented: “Davidson’s insistence that immature nationalism only becomes grown-up patriotism through the prism of the UK is very quintessence of the cringe.” But it is more than that, it represents an invisible nationalism, or Nation Denialism. Britain is so sacred, so special, so revered that it doesn’t actually exist in the same way as other lesser nations. For Conservatives and Unionists, Scottish, Welsh and Irish nationalism exists and is – by definition – divisive and based on hatred. British nationalism simply doesn’t exist. It cannot exist. This is a point made repeatedly by John McTernan and others in an attempt to prop-up the idea of the Union as a force for progressive, multinational, internationalist good. It’s an approach that is ahistorical in terms of the British States imperialist past (including both internal and external colonialism) and also defies the examination of the systematic collapse of the progressive and unifying institutions and ideas that might have backed-up such an idea in the post-war era. It’s an idea that falls apart in light of the extraordinary outbreak of Anglo-British nationalism witnessed though the Brexit campaign. The speech itself is littered with banal straw-men arguments and cute but vacuous statements before careering to some hilariously inept conclusions. “To be patriotically British does not mean that we must oppose others”. It’s an enduring myth of Conservative/Unionism that Scottish nationalism promotes itself add being inherently virtuous. It simply doesn’t. It offers the idea that people should run their own country. Nothing more. But the extract she chooses could have been a description of the Brexit campaign, characterised as it was by incredible language about ‘freedom’ and ‘liberty’ for the nation. Well, yes, sort of, except of course that John Buchan (former High Commissioner for Southern Africa, Governor of Cape Colony, colonial administrator of Transvaal and the Orange Free State, and 1st Baron Tweedsmuir, writer for the British War Propaganda Bureau – isn’t the ideal reference point for anti-establishment Orwell – but lets put that to one side) said that just before the Conservative Party spent half a century OPPOSING devolution with all the strength in their wee Patriotic not Nationalist bodies. No-one is being put down by the claim of right for Scotland to elect it’s own government and run it’s own affairs. This is a Unionist myth. But again we have the conflation of the movement for self-determination in Scotland with Trumpism and the far-right in Europe. That is the implication and Davidson seems to have suffered some sort of political amnesia, but of course Brexit and British Nationalism simply doesn’t (and cannot) exist. On obsession she writes: “Obsession – tick. We have not heard an awful lot else from the SNP in these last ten years apart from their quest for independence.” Anyone taking a brief glance at Davidson’s own general election campaign material, social media output, press releases or running commentary at First Minister’s Questions will know that it is she who is royally obsessed with the issue. Perhaps the greatest moment of this bizarre event is where the leader of the Scottish Conservatives aligns herself with the French anarcho-communist Albert Camus. She ends with a flurry of magnificent irony: “Nationalism,” Orwell wrote, “is power-hunger tempered by self-deception”. What a pity she did not study Orwell a bit more closely and she would have done well to run this speech past an Orwell Scholar before making an eejit of herself – AGAIN. Or more ridiculous than Orwellian? I have been quoting Lewis Caroll in response to the Tories in Dumfries and Galloway- as in this letter to the local paper. I am confused. I have had two election leaflets so far, both from the Conservative Party. One is from Theresa May and the other from Alister Jack. Theresa May tells me that I should vote Tory to take back control of our borders, our laws and our money. Alister Jack says I should vote Tory to stop this happening. No doubt Mr Jack will say he means Scotland while Mrs May means the United Kingdom. But if it is such a good idea for the United Kingdom to take back control of its own affairs, why is such a bad idea for Scotland to become independent? In 2014 we were told that taking back control of our own affairs in Scotland was based on wishful thinking and would lead to economic disaster. Unlike Brexit, which Mrs May opposed in 2016, but now tells me is perfectly sensible and will be an economic triumph. On reflection then, rather than vote for the Tories’ confused Looking Glass world, sensible voters should support Richard Arkless and the SNP instead. Both sides invoke any number of delightfully alternate petard puncturing. My preferences come from Æsop. Jibbering manics would vote for the unstable Arkless. Nobody ‘sensible’ would that have met him. No matter how bad the Tories are, Arkless and his band of traitors are always worse. Pro-independence people need qualified and upstanding candidates to vote for. There don’t seem to be any. Sacred, an anagram of scared. A natural conservative may well be sacred (True Blue). A Tory conservative by contrast only conserves the truth. Natural light reveals Christ in a project. The real truth is Scotland is as important as Israel. SNP & Labour need to be awaken to the wet paint glossing over Brexit. Is it time for Scotlands people to set a new course? We need to vote and be sacred not scared. Ruth Davidson is a nasty piece of work and knows very well that she is talking rubbish, but hopes that most people will accept what she says without thinking, like brain washing people into believing that they are too fed up with voting to grab the chance to escape the Tory nightmare and that having a difference of opinion is divisive. We should be all like sheep-or rather turkeys voting for Christmas. If only we had an impartial news provider…. Most people seem to be unaware that Scotland is well regarded in the EU, that there have been marches,and still more to come, in Europe for Scottish independence. There is every indication that obstacles will not be put in our way should we want to rejoin as an independent country. No one seems to want to point out that parties other than the SNP will have to toe the Westminster line so they can promise anything they like, it is not going to happen unless it suits the rest of the UK. I just hope people wake up and don’t believe all the lies! We might rejoin as an independent country but once we have done that we will no longer be an independent country. Mike you need an editor. This could have been a powerful 700word piece instead of the microwave popcorn bag of straw men, tu quoques and the sure and certain stable of argumentum ad ______. Scottish ‘Civic Nationalism’ is NOT ‘Blut und Boden’ indeed … a distinction with little difference. Sean Clerkin is more exemplar than aberration. Informal logical fallacy appealing to hypocrisy. Your piece was a screed, a philippic; more boring & less powerful the longer it droned. You need an editor with a box of (virtual) blue pencils. Thanks e.j – where is your blog so I can learn from you? One is struck by the possibility that it is not the message in the speech that matters, and the analysis of what she says. Like so much now, the metamessage is what counts. That metamessage is simply the fact of having been invited to speak at this forum as it marks her imediately as acceptable to what is ostensibly an organisation seeking after truth. I am not sure what the worst aspect of it is-is it the phoney legitimisation of a Tory, in docile thrall to her dalek leader, aligning herself with a convenient interpretation of the left-swinging Orwell-condemning both nationalism and madness of Stalinist demagoguery, and as the defender of the muddled, if apparently strangely tolerant, fair-playing, dogged independence and individualism of the British, where the right path is arrived at by some mystical quasi (or not so quasi)-religious process, combined with some British common sense- which involves the rejection of the extremes of Nazism and Communism. Never mind that it is convenient cover for a bourgeois sanctimonious, money grubbing hypocrisy that is the reality of post modern Toryism. Of course Orwell was a child and product of the empire and his colonial job,on leaving Eton, described by himself, was to make sure that the serial hangings of inconvenient and non-compliant Burmese natives went off succesfully, by sending a minion to pull on the legs of the still wriggling neck-suspended. I can well see what she jumps at the chance to speak in this forum , as she is busy propagating that now mythical condition of reasonableness, that comforting cheery, solid upper lip stiffness-this throwback to the past. That Tory message, as we drift into the Brexit decline and its likely consequences, is of course false. That wartime spirit is not an identifiable feature of the current Tories. We need to keep reminding people of the how phoney this Britishness now is, if it was ever real. A previous comment is that she was a nasty piece of work but that is possibly a failure to get to grip with the dangers of the ‘marketing’ of Ruth Davidson. It’ll take a lot more than a bit of invective to counter it. Not where I live Monty. I hear a daily stream of criticism about the standard of services in Scotland being broadcast nationwide. Ruthless has a PhD in Plumbing (depths that is). U turns and brass couplings (the bits that connect the neck to other parts) are her speciality. Of course,she only gets attention because HM press and broadcaster promote her as a “viable” alternative to a Scottish government. All that is required from Westminster’s representatives in Scotland is to do as they are told and oppose Scottish self determination at all costs. She will be toast in Scotland come the next referendum which is why she is now plying her trade south of our border. She will,however,discover as many before her have that England is not known as perfidious Albion without good reason. I too waded hip deep in ‘Ruth’s Truth speech’ and , sadly ,that time can never be retrieved . This was nothing but a political broadcast for the Ruth Party / Conservatives masquerading , poorly , as a legitimate tribute to Orwell’s work . She claimed that she didn’t want it to be biased piece of electioneering -then proceeded to do produce that , in spades . All that was missing was a tank , with Ruth climbing and on it waving her Union flag . The speech suggests that Patriotism exists only for Brits. Nationalism only exists if you are Scottish and vote SNP. What about Loyalism and Unionism and Imperialism being confused with Patriotism . For me a disappointing yet predictable speech a poor muddled effort worthy of the extreme British “Nationalist” views we often hear expressed by the divisive yet “patriotic” Ruth. OK. I think I am getting the hang of it. George Orwell wrote his novel 1984 on the Island of Jura. I saw something about it on tv recently. He was in a boating incident by Corryvreckan. and was drawn towards the great whirlpool. The outboard motor sheered off and dropped into the sea. which was eventually spotted by lobster fishermen. We have just lost our referendum on independence. in a Corryvreckan of lies. but landed on a rock higher than the waves. And we lit a fire which still burns strong. Thanks Fearghas, I had heard a darker account of Orwell’s Jura boating incident. “THE haunting brilliance of George Orwell’s book Nineteen Eighty-Four was his insight that some ideas become literally unthinkable when we lose the language to express them. The point about the continuous redacting of Newspeak, the language of the totalitarian state, was to remove words so that people could no longer imagine certain possibilities of resistance and human freedom. He wrote these words, as is well known, in an attic of the farmhouse at Barnhill in North Jura. A typewriter still sits at the desk where he worked, and from the window, there is a magnificent view east to Argyll across the water. He would have been well aware of the relevance of lost language to his crofting neighbours with whom he worked on the hay harvest. When you lose a language, you lose the world view that it encapsulates, and in the case of Gaelic, it is one which challenges some of the most deeply embedded assumptions of modernity such as capitalism and individualism. It’s from Madeleine Bunting in the Sunday Herald 2016. Thanks for the intriguing Madeleine Bunting quote. It completes a circle in my head. Reading Orwell’s 1984 at home as a teenager in the 1960s was seminal to consolidating my preoccupation with Gaelic thereafter (and indeed with the nature of consciousness). I had become increasingly aware that our secondary school education in West Dunbartonshire was failing to educate us regarding Scottish language or literature (beyond some Burns). The matter was almost literally highlighted for me in an essay for our Higher English class when a particular word I used was underlined in red, with the margin explanation: ‘Scotticism’. It had all the qualities of a Wattie Scot apoplogist’s analysis of Burns. Yet another high tory flying false colours. It had all the qualities of a Wattie Scot apologist’s analysis of Burns. Yet another high tory flying false colours. What was it Goebbels said? If you repeat a lie often enough people will start to believe it?